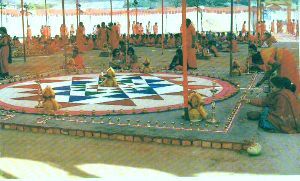 For poojas, velvis and yagnas, large symbols, called chakras, are drawn on the ground and various decorations are placed on top of them. The measurements for the geometric symbols must be as precise as possible. Each symbol represents a different element of nature as shown below. It is very important to include nature in worship because Goddess Adhiparasakthi expresses herself through nature. When done correctly these drawings reveal the Goddess's heartbeat in a manner similar to the way an electrocardiogram reveals ours. In ages past we were much closer to nature and hence to Her, but as we have distanced ourselfs from nature, we have separated ourselfs from God. Utilizing natural elements and symbols representing them helps bring us closer again. The geometric symbols can also be combined to create more complex symbols. One of the most complex and well known is the Shri Chakra. This Chakra is on the back of the medals that devotees wear around their necks. It is composed of four triangles pointing up and five triangles pointing down. These triangles represent shiva and sakthi. Each of the triangles formed by the intersection of these triangles is the dwelling place of a deity. The central point represents Supreme Goddess Adhiparasakthi Herself. 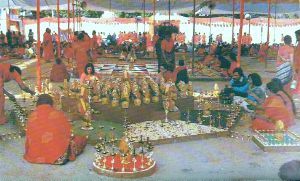 The Shri Chakra was used during a Yagna for world welfare held in New Delhi on January 27, 1995. Pictures of this Yagna and the large Shri Chakra can be seen below.